Wholesale Towels, Linen, & Microfiber For Commercial Laundries. Try something new this Clean Show. Take advantage of new wholesale linens and wholesale towels. Simply Write an order at our booth during the show to receive 10% off your first shipment, or 10% off your first shipment of a new product. 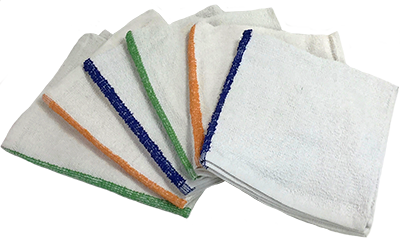 Monarch Brands wholesales towels, (both high quality and value-priced), textile rental linens, professional microfiber, and wipers to commercial laundries and distributors serving hotels, restaurants, gyms, healthcare facilities, and institutional facilities. We will be showing our newest and most popular lines at this year's Clean Show. Please fill out the form to the right if you would like to set an appointment with our textile experts. Elite Collection - Made with 100% ring spun cotton and a blended ground to provide a perfect combination of feel and durability. Institutional Sheets - Our T180 sheets are 55/45 cotton/poly blend. This is a great value offering a soft feel while still giving a competitive price worth the quality. Basic Collection - 10 single open end yarn with Kare Bleaching for an optically white appearance. This is the most basic of basic towels for federal institutional use. Not attend the show but would like you to contact me. Have Private Label Needs? No problem! Learn more about why private labeling is important.